As a new mama who is still adjusting to "mommy brain", these would be super helpful so that I don't alienate any of my new mommy friends by bailing on a playdate! Great giveaway! You might not guess this from reading my blog, but I'm not a very outgoing person. I mean, I'm friendly, don't get me wrong… I am just not the type of person who has ever been comfortable walking up to strangers and engaging them in conversation. Both of my parents have always been gregarious and can ferret information out of anyone (seriously, they can do six degrees of separation with my uncle Bobby Kiyan, who EVERYONE knows somehow), which might explain why I am so reticent. I'm okay once someone else has initiated contact, but otherwise I tend to hang back. Now that I have two kids and my loner nature infringes upon their social lives, I've realized that I need to get out there and mingle. For their sakes. Meet some mommies, wrangle some playdates. Now, how do I start? Thumbprint Trading Cards are a great conversation starter, for sure. 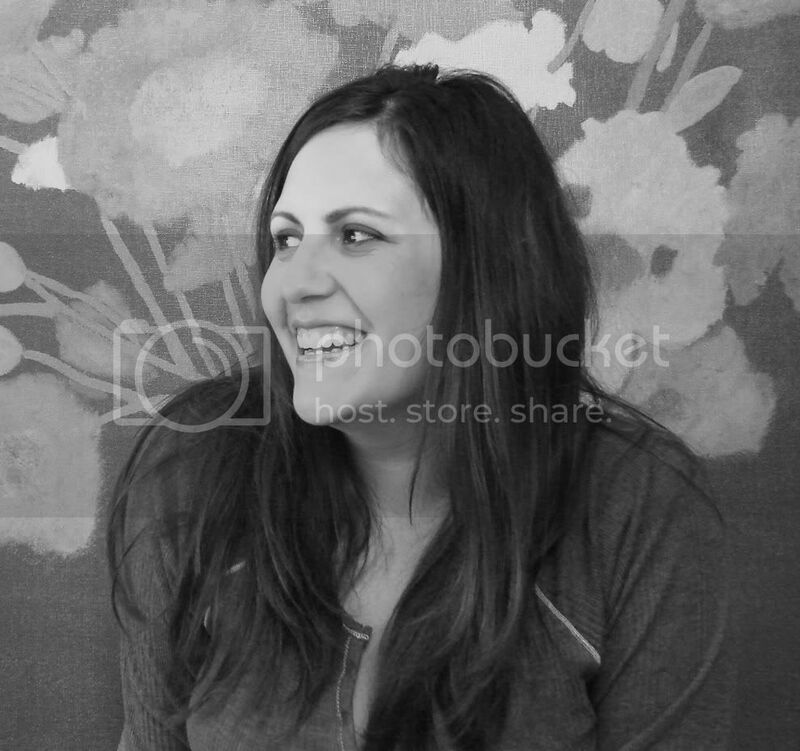 Chris Guillot started the company after her son was born and she realized she needed to make mom friends. 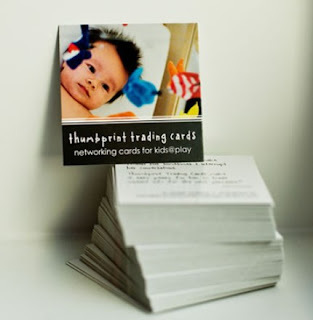 Thumbprint Trading Cards are sort of like mommy cards, but they have a unique 2" x 2" square format with rounded edges and a glossy, varnished look that set them apart from traditional business cards. You personalize them with your own photo and text, so they work as calling cards, business cards, gift tags, whatever you need them to be! Chris is more than happy to work with you to create something you will be thrilled to hand out. Thumbprint Trading Cards are a bit pricey ($55/50 cards) but they do elicit "oohs" and "aah" when you whip them out on the playground. If you're not ready to make the full commitment yet, you could try the more economical ready-made Playdate Appointment Cards ($3/12 cards). They include space to fill in pertinent info but don't have the added bonus of an actual photo of your kid to match the name to the face. 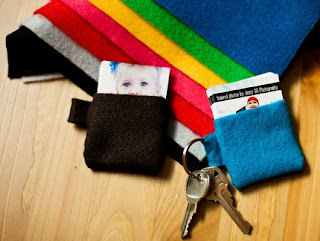 Thumbprint Trading Cards also offers a snazzy hand-sewn felt keyfob cardholder for you to keep your cards handy. It really is handy to keep them on your keychain– I know I was much more likely to whip them out when I had them close at hand. 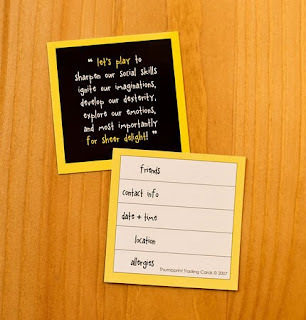 To enter and win one set of Playdate Appointment Cards and a Black Key fob cardholder, please comment on this post with your favorite thing about Thumbprint Trading Cards. Entries will be accepted through October 29th and I'll pick the winner using Random.org. US readers are eligible. Only one entry/comment per person, please. I've had you in my reader for some time now, but have never commented (I don't think, anyway). I love that the Thumbprint Cards make it very non-assuming to hand over your info! So much cooler and appropriate than a biz card! I love this! This is so much more down to earth than having "Momager" business cards. Cute cute cute! They should totally send me some to hand out at blogher. I love that the cards make it so easy to trade information -- no awkward scrambling for a scrap of paper and pen in your purse. I SO LOVE THE THUMB PRINT CARDS! So cute! W/ 5 Kids I need those! Very cute! I thought you were tres cool when you were showing these at our first meeting. I would like them because oftentimes I've met someone who I had a good connection with but felt too awkward saying, "Call me sometime! Let's have a playdate!" These are a great solution! It would be great to just have these in your purse. I *love* their designs---modern and chic--and I'd love some playdate cards! w'e're getting to exactly that stage where we're meeting other moms and kids at the park and classes that we'd like to hang out with! what a great solution to the search for a pen in my bottomless diaper bag! I love the fact they use recycled materials and are eco concious. - Makes paying a bit more more than worthwhile. thanks for the give away. HI love that you can choose your own designs or colors or leave them to choose. That suit me because I'm not known for my artistry/ design skills. Lol. Our family loves that the printing and manufacture is domestic. too much is done abroad to save a few bucks. Also loved that one side is glossy with the photo but the other is easy to write on. I love that they can attach to your key ring- brilliant! I like that you can put a picture on it. On a side note, the first paragraph about your not so outgoing personality, it's like you describing me, perfectly. Glad to know there are others out there. I think they are adorable and I love that they have a shiny, glossy covering on one side. They use recycled materials and recycle unused scraps, very eco friendly! I love that they use recycled materials and they are printed here in the U.S. The whole concept is fantastic and I agree with previous commenters who said that it makes it easier to give your contact information without an inconvience. Thanks! This is a neat idea! I love the thumbprint cards. I love that they are environmentally friendly. "Recycled 14 pt cardstock is coated on both sides for superior ink holdout which requires the use of less ink"
I love the size and portability. I love that they're SQUARE! Great! I love that they use recycled materials, very important! I really like them because I set up play dates and can't remeber times, so I end up calling them. These are perfect! 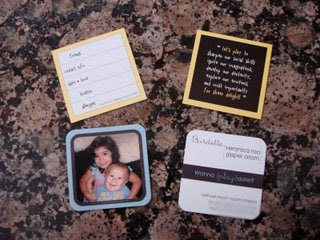 Playdate Appointment Cards, so cute! I love that the cardholders are made of recycled felt and I totally love the fonts that are used on the cards! I love that they use recycled items! Thanks for the giveaway! I like that they are uncoated on the backside which makes them easy to write on. I also like how they have a place to write allergies on! 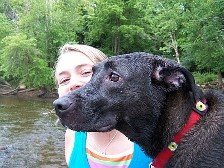 I just think that they are so darn cute! Those are very cute, and leave it to you, Ms. Stylish Naomi, to find something so cool. I'm afraid your kids will get a reputation for being part of the finer things in life! I like that these cards have a cool carrying case and that you can actually write on them (non-glossy side) rather than having the ink smear. I love this idea! I am shy at first and not super outgoing, but my six year old is a social butterfly and he would love to have his own card and would not need me to hand them out- he would be so into giving them out himself! I think I would just put his name on the back with a personal message from him. I think a lot of 5-7 years olds would love to trade cards! This is a unique idea. I like the portability of them. I like the idea of always having them at the ready. I love that it's so customized and something I'd be happy (dare I say, proud?) to hand out. who wouldn't want to show off the best picture of their cutie! i love this idea. It is sometimes hard to find a scrap of paper and a pen. super cute and something i would love to have because i can never find a pen and paper when i need it. love that you can put your kiddos right on there too so you know exactly who it is from. I am excited that they are environmentally friendly. Let's keep recycling to reduce the wastes! i love how the shape makes it stand out from the rest! clever! I love the unique shape and the vivid colors. I like the fact and Thumbprint Trading Cards are a great conversation starter! They have space for a little handwritten note! How cool! I love that the Thumbprint Cards make it very non-assuming to hand over your info! I've always been a little hesitant to give out a business card for a playdate. These are so cute, though, and not at all like a business card. These are great! Always there if you need them on the playground. Thanks for the chance to win. I love how you can take them anywhere with you! Usually there's always the awkward digging in the diaper bag for a pen and piece of paper or else info gets written on a napkin or old receipt... I love that Thumbprint Cards help to make life more simple! What I love about these is that I'm often too shy to go through the trouble of introducing myself, finding a pen and paper, writing all of my info down, and then exchanging it with another parent. These would be so great to have to hand to the other parent. It would really help my nervousness. I love that the company is mom-run. Also, I love that the cards offer easy access to passing your info on to others. What mom has two free hands to find and pen and paper to write down her number? Great idea! Thanks for the giveaway! I love that you can add a photo to the card - that's really neat! I love the thumb print cards! They are so cute, and I like the fact that they are made of recycled cardstock. I love the ability to add a photo and a note and that they're "Green"
I think they are adorable and so useful!